Thanks to everyone who weighed in on my wallpaper dilemma. My handyman is working up a quote to do the planked walls. I'm hoping it will be inexpensive, so I can go for it! 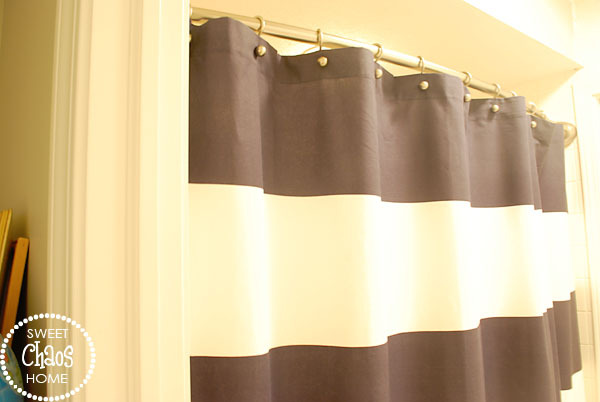 It's from West Elm, and I love the navy and white stripes. So much prettier than the nasty shower door that used to occupy this space. I really wanted to use a curved shower rod to make the shower more spacious. My tile goes all the way up to the ceiling though, and I didn't want to drill holes in it. The solution was The Gripper Adjustable Curved Rod from Bed Bath & Beyond. It's a tension rod, so I could still get the curve but without damage to the tiles. Some of the product reviews said that the rod gets rusty. I hope that doesn't happen, but I'm keeping the box and receipt just in case. I'm going to be unplugged for awhile, as we're heading to Arizona for spring break. After this loooooong winter, I can't wait to get to the desert. We're visiting my best friend and her family in Carefree. How can you not relax in a place with a name like that? Looking forward to catching up with you when I get back. 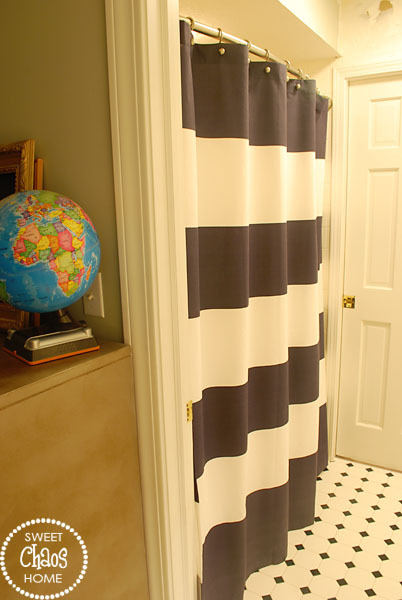 Love that shower curtain from West Elm...was just there today and saw it. Hope the contractor is reasonable...I want to see planking in your bathroom! Have a great time in Arizona...so pretty there. I really like the curved rod, I never heard of them until recently. I wonder if one would make my small bath look larger? 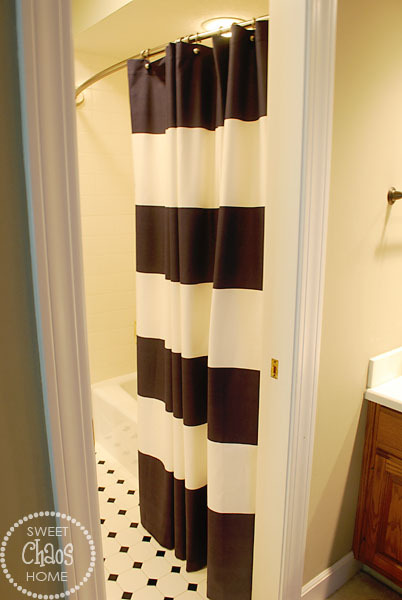 The shower curtain looks great, especially with the floor. Have a carefree time in Carefree! (Couldn't resist!). Love the new shower curtain, Carolyn. I have a curved curtain rod in the kids' bath. The rod was installed too far out and the curtain hangs too close to the toilet for my liking. I really want to remove it, but I'm scared of cracking the shower tiles. It does make for more room in the shower, though. Love the new shower curtain and curved rod. I wonder if you could give it some type of heavy-duty clear coat spray to protect it from rust? looks great with the floor! Such a pretty curtain! Have a great time in Carefree.